I’ve been to Napa Valley a couple times, and actually enjoyed the time spent there. The whole place does seem like a giant foodie amusement park full of elitist snob appeal. But believe it or not, you can actually find some places among all the glitzy wineries that aren’t about extracting lots of money from free spending tourists, but are about the wine. You can even find wine in Napa Valley which is actually worth what you pay for. The place does have some redeeming qualities. More good news about Napa Valley is that a brewery recently opened up at the south end of the valley, in Napa. Since it’s own by the Smith family, they decided to call it Napa Smith. Who is this mysterious Smith family? Their website doesn’t say. But whoever they are, they hired legendary Don Barkley as their brew master, who has 30 years craft brewing experience, which is a long time considering many craft breweries haven’t even been in business half as long. Last fall when in Napa, I picked up a bottle of their Pale Ale. Sorry to say, it was rather underwhelming. It seemed rather weak and watery, and just not that interesting. I was surprised, and after seeing some positive reviews of their beers, figured maybe I got a bad batch or a bad bottle. Seemed like Napa Smith was worth giving another try. I’m glad I did. 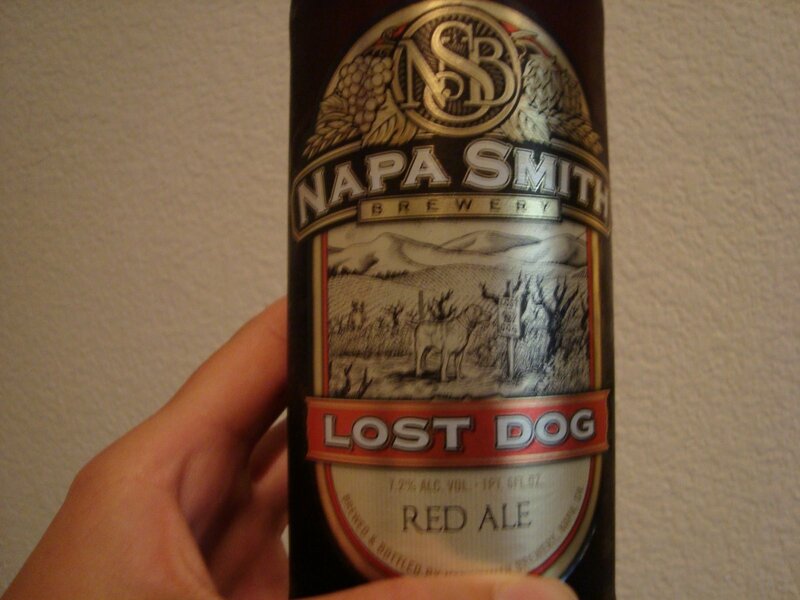 I opened up a bottle of Napa Smith Lost Dog Ale that hit me right away with a strong fruity aroma dominated by grapefruit. The flavor with more of the same, rather fruity dominated by grapefruit, although I was picking up a little apricot. It’s rather malty, but for all the malt and fruitiness, very little sweetness. There’s a little hop bitterness and a slight astringency at the end. I found this one rather smooth and fresh tasting. I also tried Napa Smith Amber Ale, which seemed very rich and malty for the style. The malt had a slightly roasted character, without any real sweetness, and the brew had a dry finish, with very little hop presence. Next Next post: Get Ready Sacramento Beer Runners: Blood, Sweat and Beers is On!